Tremblant Ski Resort, 90 minutes northwest of Montreal, is Quebec biggest with the best ski village. You have to visit this cool alpine resort to appreciate it. It’s a modern Intrawest designed ski village, that looks like a centuries-old Alpine village, like something out of a ski fairytale. The skiing at Tremblant is diverse, with over 2,000′ vert and four unique mountain aspects. 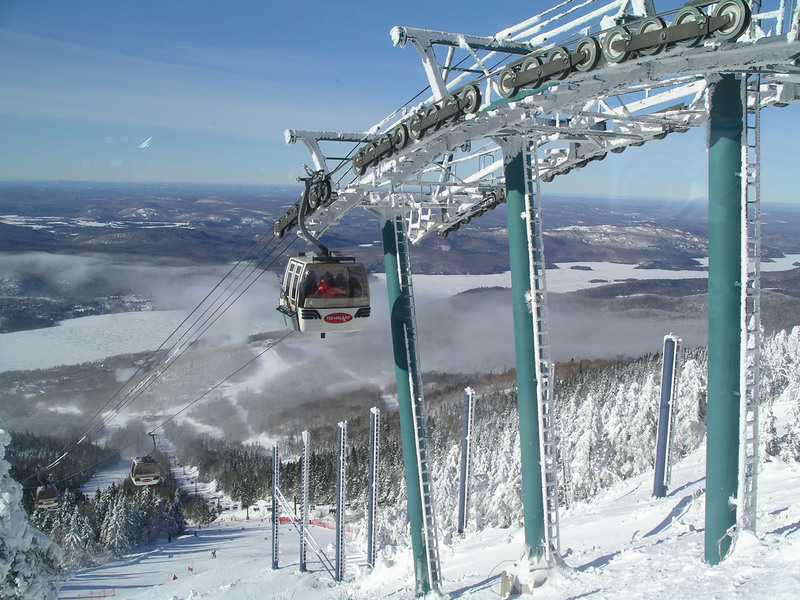 The best part is Tremblant’s swift base to summit gondola, a 10-minute trip in a “telécabine.” While not the towering Alps, Tremblant is a good-size Eastern mountain at 2,871’ and convenient from most condos and hotels in village. Skiing from Tremblant summit, where many lifts converge, you have great view of Lake Tremblant below. 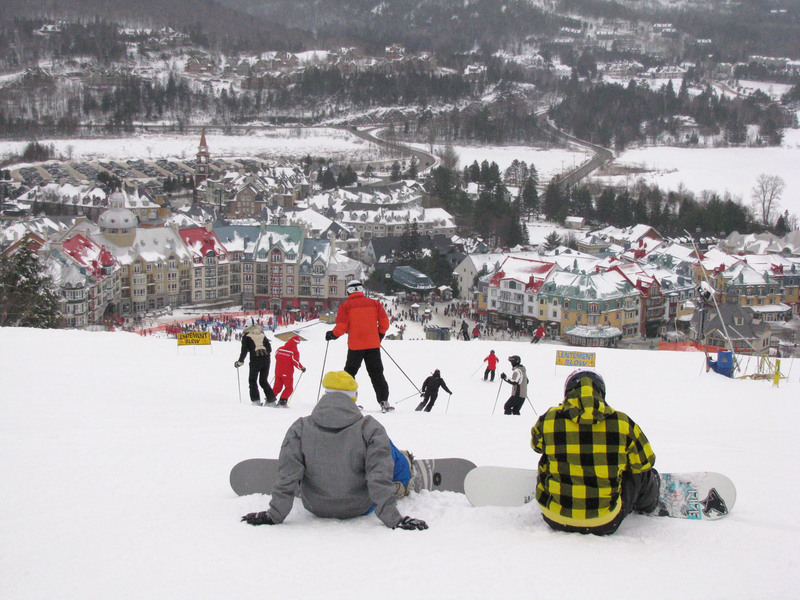 Tremblant’s South Side faces the village, with ego-pleasing wide trails like Kandahar and Grand Prix, and the Flying Mile Quad over the ParcGravité – which is loaded with big terrain park elements. 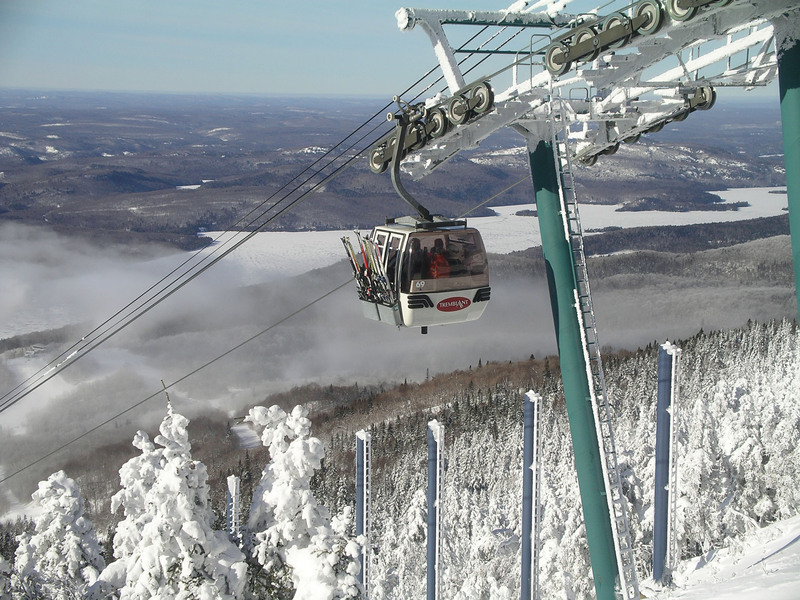 The North Side, Tremblant’s backside, features a few pitched boulevards, a couple of narrow old liftlines, and the hair-raising steeps of Dynamite – the steepest trail in Eastern Canada at 40-degrees! The Edge is a tucked-away pocket with a stash of black-diamond glades, bumps and jumps. 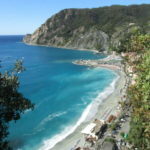 Versant Soleil gets the most mid-day sun, as its name implies. 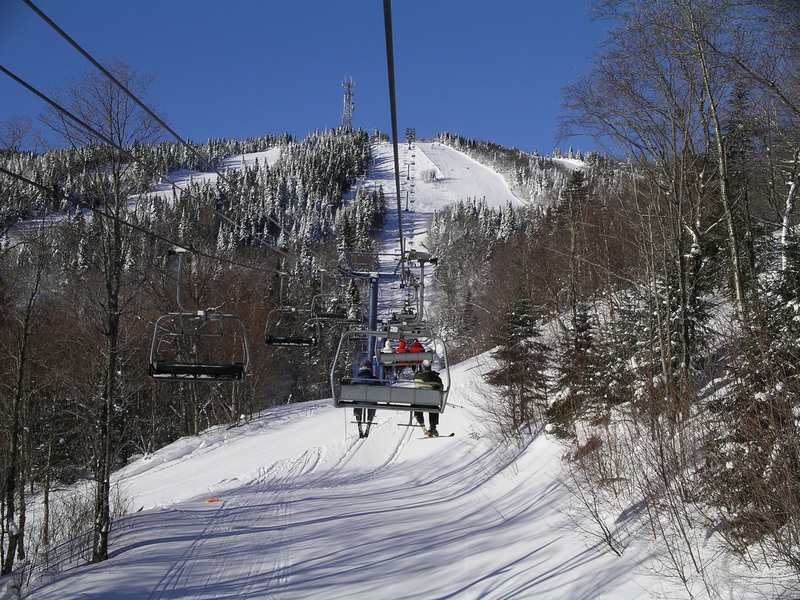 With a picturesque mix of tree runs and naturally undulating trails, this mountain section has its own distinct flavor. For lunch, we like the Summit Lodge “Le Grand Manitou”, which offers splendid views of the surrounding Laurentian lakes and mountains. 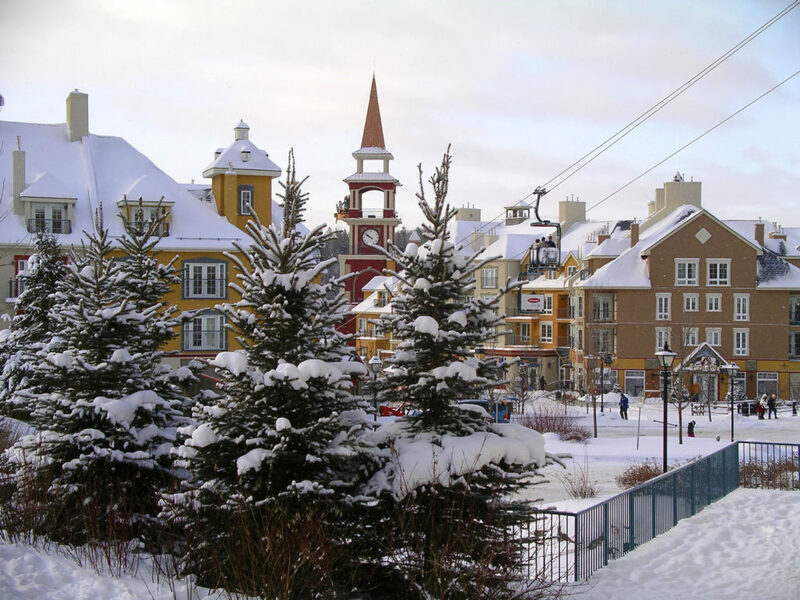 You can also ski into the village for a European gourmet lunch at a charming café, for less. 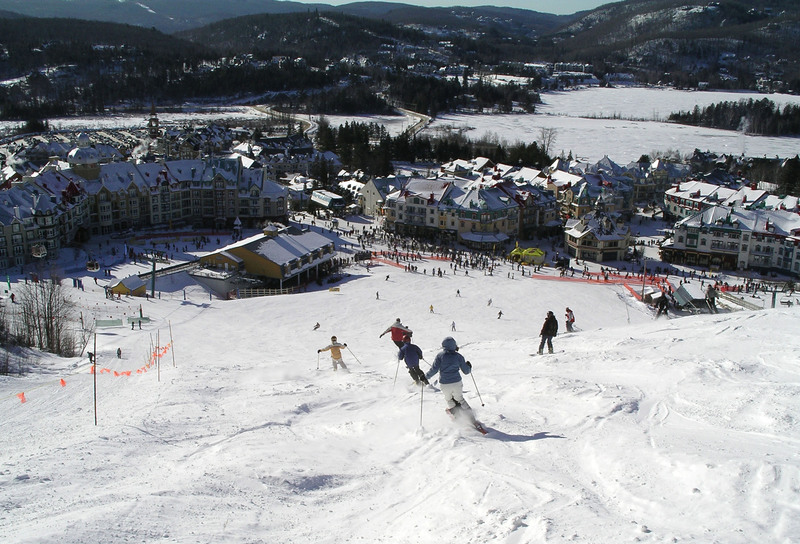 THE Place to stay is the Fairmont Tremblant, the only luxury five-star hotel is ski in ski out hotel – with closest proximity to the lifts, and beautiful décor inside and out. 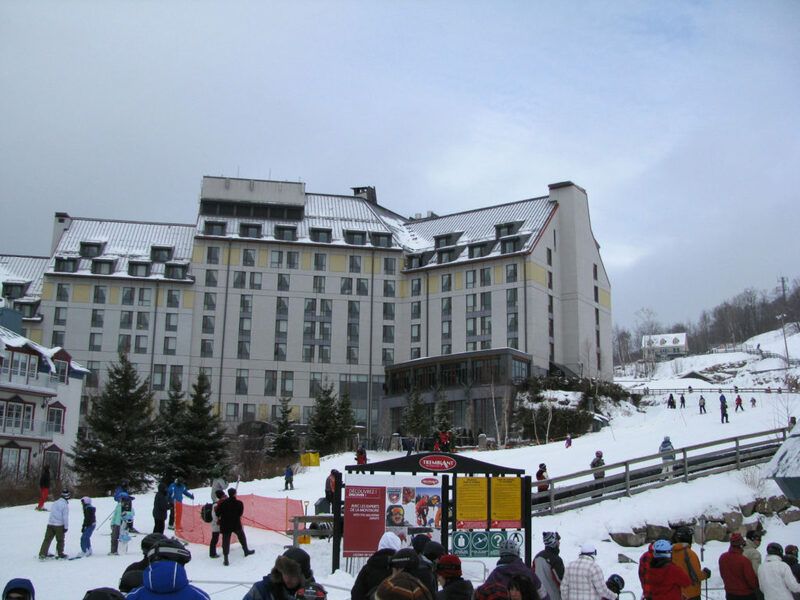 Ask for a slope view room, and defiantly hit the outdoor hot tub and spa, and enjoy drinks on the terrace by the firepits as you watch skiers last run. This is a sister resort to Fairmont Chateau Frontenac in Quebec City, and Chateau Lake Louise and Banff Springs Hotel both in western Canada. 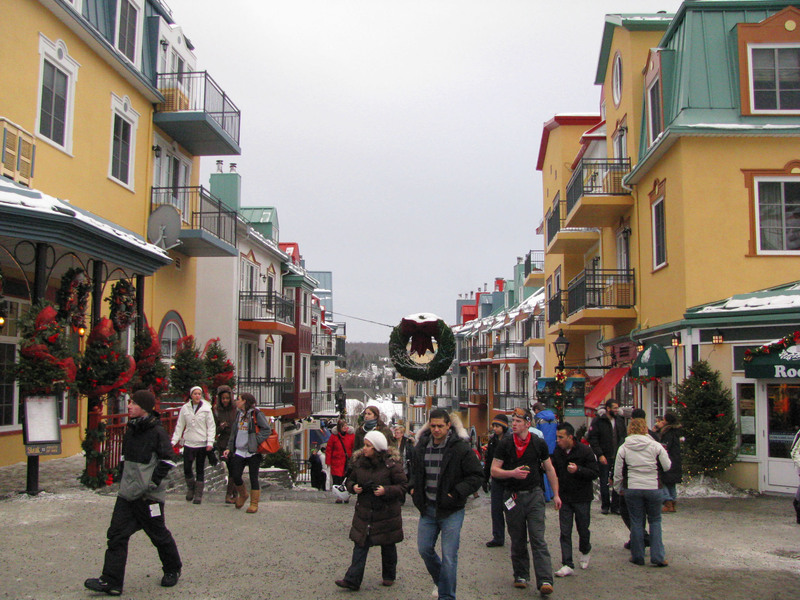 Apres ski, stroll Tremblant’s charming ski village, its like modern Zermatt, car free and brightly colored, bustling with boutiques and pubs connected by snowy sidewalks. Have a Beaver Tail – the Canadian version of fried dough, shaped like . . . you guessed it, a beaver’s tail. 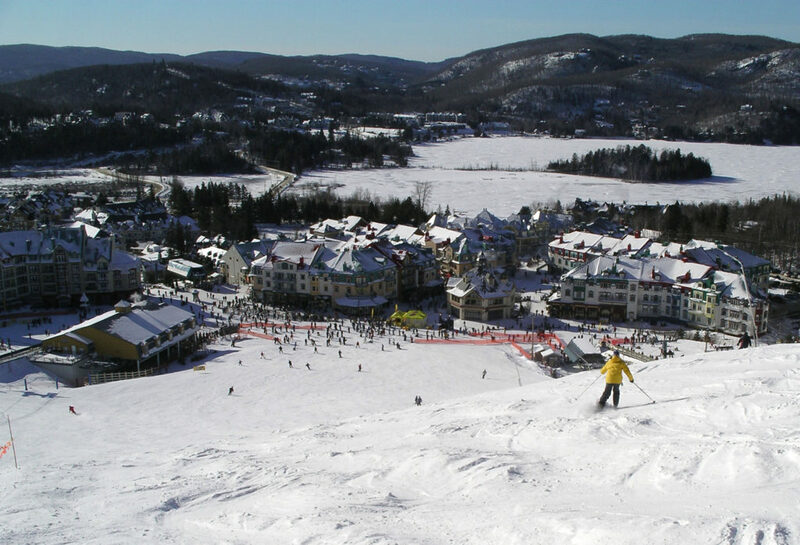 Kids love them, and they love Toufou –Tremblant’s oversized reindeer mascot who parades through town shaking little skiers’ hands. La Source Aquaclub is a Laurentian lake themed Disney-like amusement park of indoor wading pools, trees, rocks, a rope swing, and waterfall. It is a big splash for apres ski swimming and soaking. 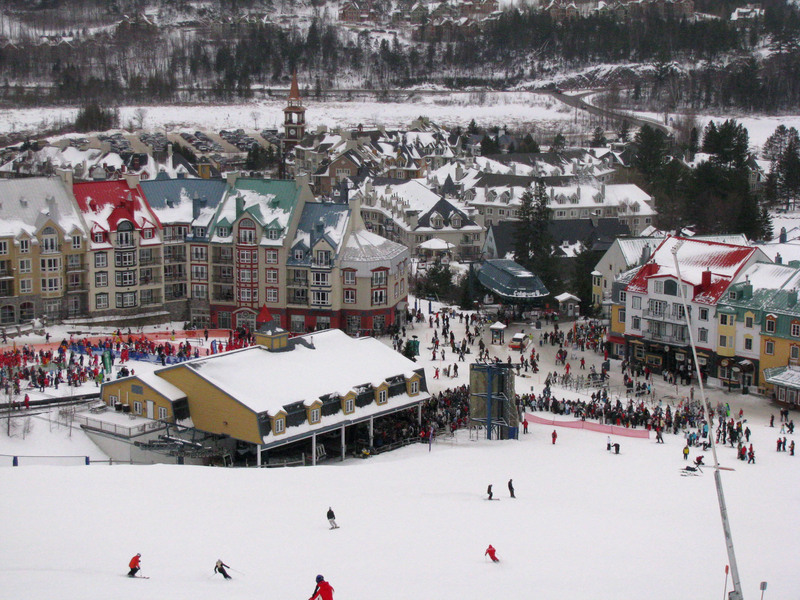 Night skiing is an option a Tremblant, but we find the village too tempting in the evening, with so many great French restaurants and bars. We love fondue at the cozy La Savoie. 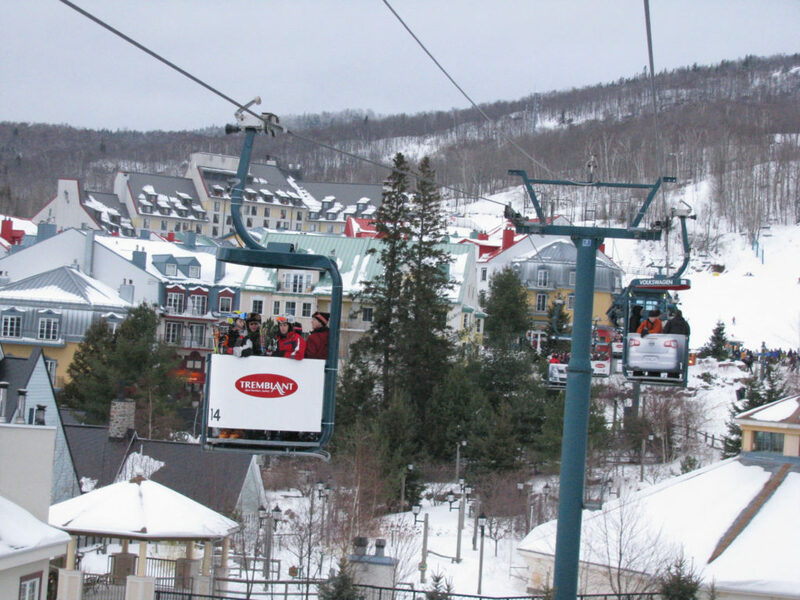 Parlé a bit of Francais, Tremblant is French Canadian, but everyone speaks English too. 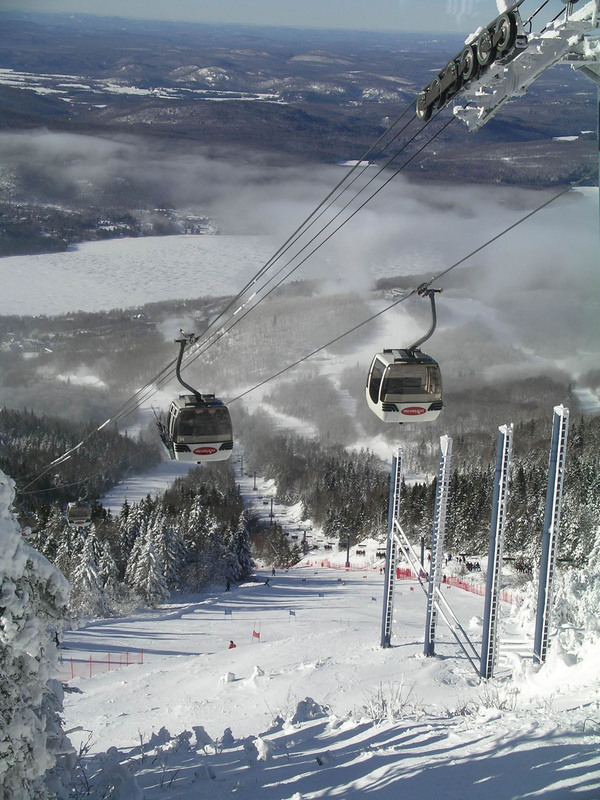 This ski resort has an international feel because of its French heritage, and global recognition. 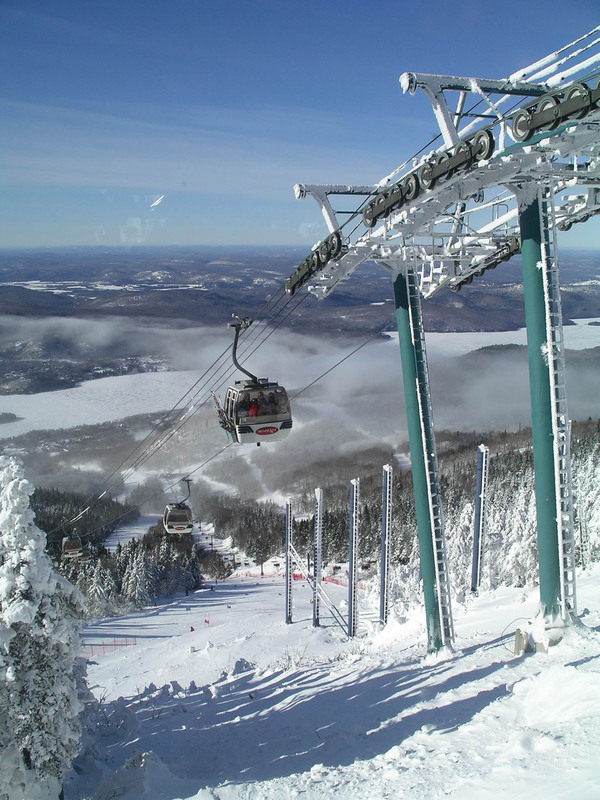 Tremblant gets chilly, you might tremble so far north in Canada with temps at –15° Celsius, whatever the Fahrenheit equivalent – its nippy. Night life at Tremblant, just strolling the attractive pedestrian zone is fun. 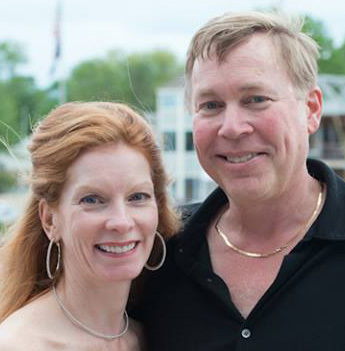 Bars like Le Shack pump out music and liquid cheer til late. You will not likely see these party people in line for first tracks next ski morning.